Pikobyte on Why did it have to be Snakes! Some cards like Natural Order help you to fetch craterhoof and win the game. 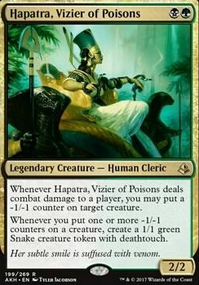 Natural order wins a lot of games in my Hapatra deck. Feel free to check the list if you need more suggestions. Daedalus19876: Sick list dude! +1 from me! My only suggestion for the slot you need is Archfiend of Ifnir . You only have Mox Diamond and Survival of the Fittest to proc its effect. I know about the Generous Patron combo, but you need both of them out and Survival/Full hand for it to work. I'd say the pod is closer to 90%ish. The Windgrace ain't anything special right now, it's literally every cost efficient piece of interaction while ramping up to an eventual Obliterate & Co.
Yeva isn't just an orrery in the cz. 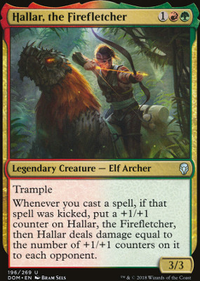 Yeva represents the same threat that 2 untapped islands shows, while acting as a form of "protection" for your combo, as you don't have to decide whether you're going to play interactive or try to combo in your turn as it's then available across all turns! That's like... a huge buff! For this reason I feel Yeva is stronger than Yisan, as Yisan is in front of your opponents and your steps to winning are broadcast - despite any protection you may have. This more or less encapsulates exactly how I feel about Yeva, however, she requires godly hands to outpace Yisan's inherent consistency. I would never undercut her strength, as I am absolutely obsessed with the precedent she establishes. In a world where every hand (and following draw) is optimal, I would be brave enough to say she's "better" than Yisan. As I said in my Disclaimer, I think she's better in the right context, but she'll never compete with the bard's consistency. 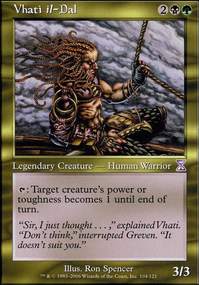 In fact, whenever Yisan is in my opening hand, I just commit to him until he's dealt with before having Yeva pop in with a replacement combo-crew. Personally, I don't think Shaman is that great in Yisan, but that's just me. 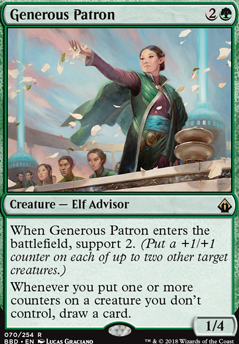 Generous Patron : Cards like this in the deck are really here to gain CA and the Elf-body + outlet role in mind. Patron only needs one creature, if I feel like I won't be getting value out of it, I pitch it to Survival, Fauna, Chrome Mox, Natural Order, or Eldritch. While it's safe to say I have used Wirewood Symbiote to get procs off of the draw effects, I only do it in situations where I am out of steam or looking for gas. Think of every draw etb in the deck as an outlet, side from its primary function. Thought-Knot Seer : I loved this guy in Yisan. He's definitely a win-more in my context and my inability to play him at instant speed is enough to deter me from ever considering him. 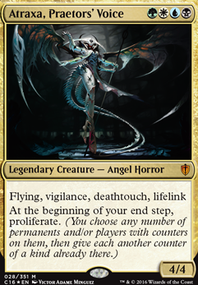 Lys Alana Huntmaster : The contexts where going wide proves to be a viable choice in this deck usually means I have won. 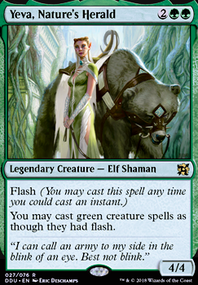 Facilitating this card might be too difficult and I would rather go for Sylvan Offering for the going wide option since it also works with Selvala, Heart of the Wilds along with everything else you said. Heritage Druid : Never worked in the deck. It finds it hard to truly commit to the Elf-subtheme. 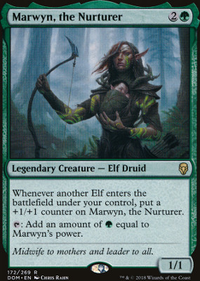 As you mentioned, there are only 7 non-mana producing elves. EDIT: I actually even tried to make Birchlore Rangers work to no avail. Ymmv is "your mileage may vary"
Sounds like the pod is kinda 75%-y if he's banking on mld... but I'd like to see it, as I imagine a staxy divergent build would be cool in Windgrace. Abusing Defense of the Heart into kiki-conscripts / into a hulk based win seems simple with a good value engine in the cz. I'll have to test out Shaman in Yisan, as a win con at 3 verses seems strong. Below are some questions and suggestions I have from reviewing your creature base. Pros: patron can be used time & again with Wirewood Symbiote to generate the CA you need to win - that's pretty nuts; Cons: patron requires your opponents to be using creatures. patron can find you a win condition by being flickered via cloudstone curio repeatedly until you draw a win; furthermore he can be used to flicker & buff your board until you are able to swing for lethal - win con, divination and half of an engine. TKS is a win con - by bouncing & replaying he can exile all relevant cards from their hands as they come in & force opponents to deck. does nothing on it's own. pros: turns your 7 non-mana elves into mana elves sometimes. cons: Not always online. Does nothing on it's own. Not a fantastic engine on it's own - but a semi-efficient elf at 1 mana. Greetings! I am interested in how focusing on loyalty counters with Pir and Toothy is treating you. I like the inclusion of Spike Weaver especially in a superfriends build; I might have to get one for my own deck! For my build of these partners, I instead focused on making great use of Toothy, Imaginary Friend itself, leveraging many +1/+1 counter cards, which Toothy consistently turns into a threat, and more importantly card draw. The deck is designed to be able to play many cards drawn with Toothy when it is removed, leaning into cheaper ramp and threats, but planeswalkers are obviously good for this strategy too, including Nissa, Voice of Zendikar . Karn Liberated is excellent and totally worth acquiring as repeatable removal for anything, which is useful for this color combination. Even if Toothy is removed early, the deck can combine Pir and other spells and +1/+1 counters in creative and interactive ways. In particular I have been impressed by Walking Ballista (again, unique effect for these colors, and serious synergy with Pir) and Generous Patron which I believe are both totally serviceable in your build. One thing I like about each of the Partners: blinking and even cloning Toothy results in drawing the cards from the counters and then replacing all the counters on Toothy (or the toothy clone). I have included Repudiate / Replicate and a couple other clone cards for this reason. Another thing I absolutely recommend is trying two-headed giant EDH with your group. Pir, Imaginative Rascal affects your teammates' counters too, which can matter in totally unexpected ways. Here is a link to my version. Good luck with these crazy kids! OptimalGreen: Blooming Marsh (or a basic) would be my cut here. GoldenGolgari: Honestly, I do not have much discard in this deck. The only significant discard spell is Survival of the Fittest , which can tutor him (plus Sadistic Hypnotist in a severe pinch). Much of the time, Archfiend of Ifnir just gets cycled, which is fine. However, when I have an ability to draw a significant number of cards - particularly with Skullclamp or Generous Patron - my discard source is my maximum hand size. Notably, with Generous Patron , if I end the turn with 7+ cards in hand, I kill all of my opponents' creatures on the end step and draw cards equal to their total toughness (b/c I discard down to 7 in the cleanup step, place -1 counters, draw cards, return to the cleanup step again, repeat).